In Manhattan it’s hard to find great pierogi. I often find them too thick and heavy. Well M:s mother happens to be a great pierogi maker. She makes them so thin and light and fills them with sauerkraut and mushrooms, meat, or cheese and potatoes. I easily end up licking the plate. After all she is from Poland and as lovely as she is, she makes tons of them when we are around. This summer I asked her for her dough secret. I was hoping to get the whole recipe written down, but her answer and recommendation was very short, “make them with warm water”! Mix the flour and the salt together with the eggs. Heat up some water and mix small parts at a time into the flour mixture. I did it by hand but I think it works perfectly well to use a food processor. On a flat surface knead the dough until it’s firm and soft. Cover with a damp tablecloth and let it rest on the counter top while you are making the fillings. Here I made M:s Spicy Portobello Mushrooms. I used less water, as I didn’t want the filling to be too loose. Instead I used some cream to make it thicker. Mash the potatoes with the egg white, some melted butter and milk. Add the farmers cheese as noted or to your own taste. Mix well and season with salt and pepper. Lastly add chopped cilantro. Note that cilantro is not really a traditional ingredient for a pierogi filling but I don’t think there are any strong rules on how to make fillings. You take what you have at home. I used a very mild type of cilantro. However many recipes seem to use fine chopped onions or chives. I will try garlic next time. Uncover the dough and if necessary knead it some more. Divide into 4 pieces. Use lots and lots of flour while rolling one piece at the time to a 1/16” (1 mm) thickness. Make 3” circles and divide the fillings on top. Cover the filling and pinch the edges firmly to seal. Pat some more flower on every pirogi so they don’t stick together. If necessary add some more warm water to the dough as the flour makes it dryer in the process. Repeat until you have about 75 lovely pierogi. Heat up salted water. When the water is boiling drop some of the pierogi in the water. When they are floating up to the surface let them boil approximate 1 minute more. Fish them out with a strainer. Top with melted butter and fried bacon and onions (chopped finely). Serve with a salad and some sour cream. Well it is a long process… but luckily it was worth every minute. The pierogi ended up super thin and didn’t last very long. There are many different versions on how to make pierogi. Some use sour cream and some use the egg yolk in their dough. My dough was inspired by several recipes but are quite similar to Kate Hopkins version. 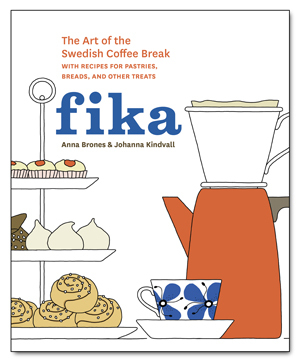 Helt underbar blogg med fantastiska illustrationer! Välkommen tillbaka till bloggandet — du är efterlängtad. I absolutely love your illustrations! I discovered your blog just when you stopped posting in May. Glad your back. The Peirogies sound delicious! I will try it out. They are very similar to empandas made in the Philipines and I do find the dough too thick as well. Empanadas in the Philippines sound interesting. You’re right about the dough, Johanna. So many machine-made pierogi have a thick, tough dough. It’s hard to find a softer dough but we’ve found that the warm water does indeed help. And, excellent illustration! 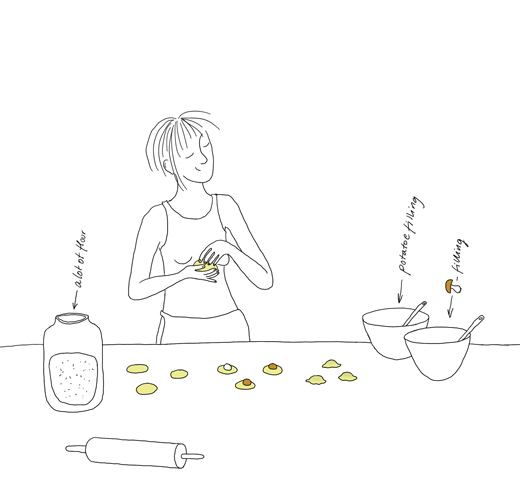 Wonderful recipe and illustrations! My kids are crazy for pierogi, and I’m going to use this opportunity during Christmas break to make some from scratch with them. One question, if I don’t want to cook 75 all at once and would like to freeze them, do they require parboiling first, or can they be frozen as soon as they are formed, perhaps placed in single rows on baking sheets in the freezer to prevent sticking and then tossed into bags once frozen through? Melanie, I just asked an expert in pierogi and she allways freezes them with out boiling. They probably will stick together but she puts them fozen directly into boiling water and then its no problem. Perogy-making has always been part of the Christmas tradition in our family. We sit down to a feast of perogies every Christmas Eve. What I do, when making my perogy dough, is, I use the warm potato water for the liquid. It works great and it helps flavour the dough. Thank you for your simple recipe, my elderly gradmother who has made pierogy for years forgot her recipe and we wanted to make homemade pierogy for my sisters visit tomorrow. Loved the picture too. Thank you for your beautiful and funny blog!! I bumped into it by accident and have been reading often. What a wonderful recipe – very similar to my grandmother’s. Pierogy can be fried after boiling. You can fry them immediately in a large skillet with sauteed onions and butter. Fry perogy on both sides till golden brown. perogies very yummy i have been brought up on them since i was born. my mother made them perfectly. but i have been unable to reproduce them. your recipes sounds like what my mother did. When you say “regular flour” you mean “all-purpose flour,” right? Just want to make sure. Gotta give this recipe a try soon. My mother’s parents came from the old Czech. Her pierogis were usually stuffed w/cottage cheese, or prunes — is there anyone that has eaten them that way — if so –how do you make them? Thanks! pierogies with a meat mixture made of beef heart, beef liver, beef kidney and onions. My step father was savic (Litavec) and made great pierogies- He used 3 kinds of cheese in the potato filling- made a few dozen- mixed sauerkrut with the remaining potato filling and then used cooked prunes to finish off the dough. He would freeze them on waxpaper on a cookie sheet for a few hrs before putting them in freezer bags. Dad always sauted them in butter with onions. I am trying to find out how to cook the dried prunes for the filling?? Thanks for the recipe, not only was this the fist time I’ve made pierogi, it’s also the first time I’ve eaten them, delicious! thanks again. I made the pierogi and they were great. After I boiled them and they cooled, I fried them in butter/onion just for some extra calories 🙂 They had a hint of a taste of flour. Did I not roll them thin enough or is there some other helpful hint I should try to not have that taste of flour? Floury taste is no good. It might be that you used too much of flour while rolling them out. As I say in the recipe; I always add more warm water if the dough gets too dry. By the way I have a dough waiting in the fridge. I will serve mushroom pirogie for starter at tomorrows Christmas day dinner. I have been trying to get a friend to show me how to make these but it hasn’t happened yet. I am going to try this recipe since it seems easy and I love perogies. Is there any issues with using boxed potato flakes for the filling? I have ben making pierogies for over 25 yrs..I tried this recipe & was very pleased with the taste, they reminded me of my mom’s…One thing I would like to state is that you don’t need lot’s of flour on the board when rolling..Just a dusting is what I did..Another thing is dough must be very thin..After cutting my circles out I went over them with the rolling pin to make sure they were thin…After pinching I placed them on a clean pillow slip & they never stuck…Prior to boiling them I like to recheck the pierogies pinching again…On the ends I pinch out flat, as nothing worse in my opinion is thick edges..Also I always put my pierogi dough in a plastic bag when it rests….I place scraps in a seperate bag & use last if needed..
Found this on a link in Wikipedia. I had made pierogi with my grandmother for years as a child and teenager, but you guessed it, without a recipe. While I remember the process visually, I didn’t know where to start. I so appreciate the detailed instructions and recipe. Does anyone have the recipe for the filling made from sauerkraut and mushrooms? I recall the mushrooms need to be minced, and my grandmother did something to the sauerkraut, and chopped that finely also. Thanks for the wonderful recipe! I was going to make these with a friend yesterday but he and I were busy with other things! So I’m going to go and get some of these ingredients and try it out for myself.. now the meat and onion ones sound like bierocks! The only thing with that is I use those frozen dinner rolls balls from Rhodes and roll those out and stuff them with meat/cabbage/onion mixture and bake them about 20 minutes until golden brown. Someone else said they use the dough for empidillias too! I just used the recipe to make pierogi ruskie (I’m something of a Poliphile). They came out great! Here’s a tip: if you can’t get farmer’s cheese or white cheese, a good (and pretty similar tasting) substitute is crumbled goat cheese available at Trader Joe’s. I used two 8 oz. containers of it. I have just added this page to my favorites 🙂 Thanks Johanna! I am Polish and pierogi are a big part of my culinary culture. My mother makes sweet pierogi with blue berries (my favorites), cherries, plumes, apples (with a bit of cinnamon)or strawberries always with sauce made of sour cream with sugar and vanilla. Living in Spain it’s not always possible to ask my mother for help and now I have this recipy which comes very handy just before Christmas. Thanks for the receipe. My grandmother was Slovak. I remember a few additional tips from when I used to make pierogi with her that may be useful. First, always knead the dough outwards from the center on your board. Also, keep a little bit of the warm water and flour in two separate glasses near the board. You can use the warm water to pinch the pierogies closed. You can use the flour the rest of the time when handling the pierogies in order to keep them from sticking to your hands. Lastly, for fruit-filled pierogi, it’s better to avoid using fruit spreads/pastes. Instead use dried fruit which you can boil to soften-up and then fork apart. My mom mixes fried onion with the potato and cheese filling. However she does not like to use farmer’s cheese, it is too dense. Johanna, please let me know if you would like a nice Polish pottery dish to serve your Polish food on. I would like to send you one for free. I was told the secret to keeping the pierogi from opening is to use sour cream in your dough. Kim: Sounds like a great tips! Thanks. There are many churches in the South Side of Pittsburgh that sell fantastic homemade pierogies! South Side has a lot of ethnic background to it, many Slovaks and Polish people live here! We all love pierogies, including me! I just finished making your divine pierogies…okay,since I was doing these alone, it took a couple of hours (not including the boiling time)but, WELL WORTH IT! My count came out to 68 (the better at rolling I got, the thinner the dough and the count increased). I used a potato/onion/cheddar/bacon filling and really like the result. I suspect your dough is more delicate than the other recipes that I have seen using sour cream – their yield is a fraction of yours. For a first timer…I only had one pop open (of the 20 I boiled). (after boiling, I sauteed with butter and onions). The rest are in the freezer to enjoy at a later date. Hi Susie! I’m so happy to hear such a thorough report from someone who have used my recipe. I’m happy it worked out so well. The sound of your filling sounds lovely. Thanks for sharing. I have been making pierogi for years and got the recipe from my Polish Great Aunt. She puts a teaspoon of baking powder in her dough. The saurkraut filling is easy. Canned or bagged saurkraut should be rinsed thoroughly in a collider and excess juice squeezed out. Sauté butter and an onion and add saurkraut. Add salt and pepper to taste. Simmer saurkraut for approx 2 hours until saurkraut is translucent. This reduces a little of the sourness of the saurkraut. Cool saurkraut and add a large 16oz container of dry curd cottage cheese. I squeeze the dry curds when putting into saurkraut mixture so they are little. If you can’t find dry curd cottage cheese I buy the lowest fat content and rinse out the excess milk fat. Then I squeeze the curds as we’ll to make them smaller and mix into the cooled saurkraut. Very tasty even if it does seem weird to use cottage cheese. I use it also with my potato filling. The filling sounds wonderful! I like saurkraut filling with mushrooms. My mother-in-law always makes that. Will try your version some day.